Sharing their most memorable moments from an 18 day tour of India, David & Lynne Hill, of West Yorkshire, UK, capture the heart of this magical country with its beautiful people and landscapes. There were so many experiences that most people would normally never see – our India trip was one big highlight! Yet we’ve managed to select our top five favourite moments from our visit in January 2011. The Nor Khill hotel in Gangtok is absolutely fantastic, being the former hunting lodge of the King of Sikkim. We were greeted with a shot of the local cherry liqueur and presented with a silk prayer scarf. Rumtek Monastery was also incredible. The buildings are all very brightly painted and you approach through a sea of prayer flags and prayer wheels. This is one of the most significant monasteries in Buddhism and is also a Buddhist university. Lynne was able to light a butter candle in memory of her late mum and we were privileged to stand in the prayer hall during the chanting. 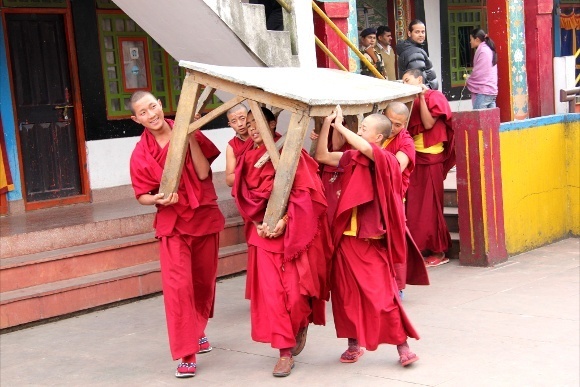 Even though this was a very spiritual thing it had its humour as there were several cheeky young monks in tow! Visiting the artist colony and the last resting place of Mother Theresa in her convent in Kolkata. The Golden Temple in Amritsar by night and its kitchens during the day – they feed up to 10,000 people every day using only volunteers! 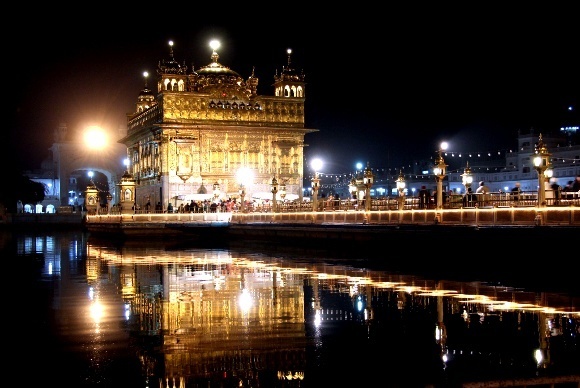 The best quote of our trip to India came from our guide Paul who explained that pilgrims from all over the world can be accommodated in the Golden Temple complex for three nights free of charge! To be able to walk the last mile or so down to the Ganges in Varanasi before dawn with pilgrims who have walked from all over India, sometimes taking weeks to do so and with nothing but small bundles of food and a few possessions carried on their heads, was one of the most humbling things I have ever experienced. 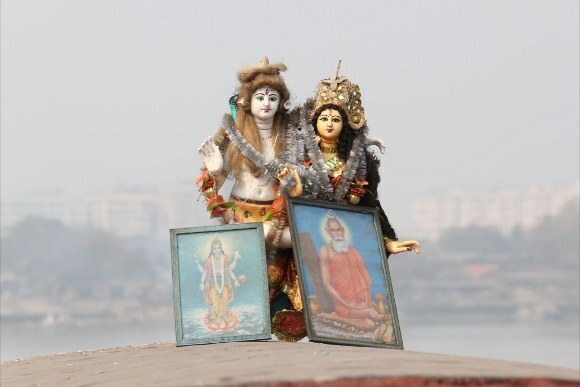 The Ganges is the holiest and most sacred place for a Hindu and is known as ‘Mother Ganga’. To walk with them, listening to their excitement and laughter and then fall silent when they see the Ganges for the first time as they approach the end of their journey; then to watch as they carry out their sacred ablutions in the waters as the sun comes up, was something I will never forget. I use ‘privileged’ a lot when talking about the things we saw in India, as in ‘we were privileged to be there’ but in this case it doesn’t seem that even that word describes the feeling I had on that day. India’s people: Wherever we visited we found friendliness, impeccable manners, polite curiosity and a willingness to help. This willingness sometimes went further than actual accuracy as the smile and nod/shake of the head might have more to do with not wanting to let you down. After a few days, you get used to it and it’s one more of the many things to love about this wonderful country. The organisation by Enchanting Travels was impeccable and we soon settled into a relaxed routine – yes, relaxed, not a concept that usually goes with travels around India (and this was our fourth trip to the country)! 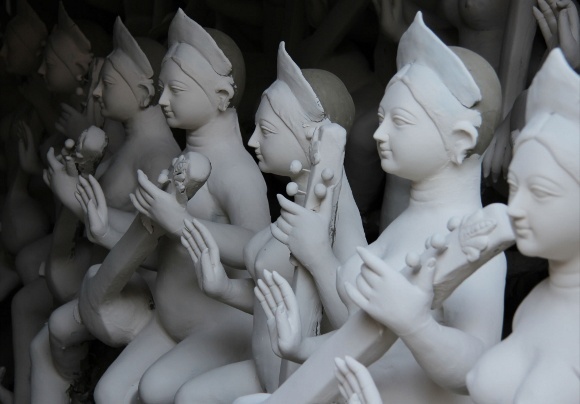 Plan Your India Tour Today!